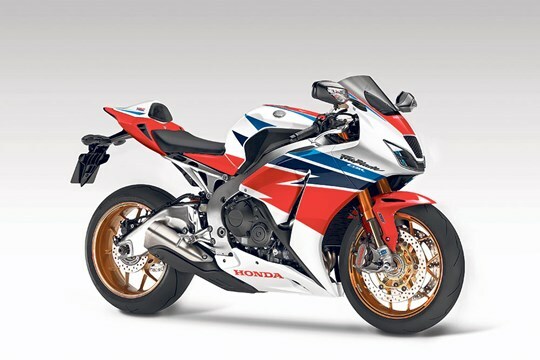 This MCN computer-generated image of the next Honda CBR1000RR Fireblade is the most accurate interpretation currently possible of the bike Honda hope will take them back to the sharp end in the superbike class. The images have been created using newly discovered patents revealing intricate technical details, insider information, and MCN’s racing sources, to create the most up-to-date impression of how the bike will look when it’s unveiled at the end of 2016. There’s no doubt the 2017 Fireblade will need a comprehensive makeover, in part to satisfy forthcoming Euro4 emissions regs, but it will also be getting a complete electronics package, more power and a hefty cosmetic refresh. MCN sources have revealed that the new Blade will get electronically adjustable Öhlins suspension, and a full suite of rider aids – including a new version of the C-ABS system, traction control and anti-wheelie. Mechanical changes are expected to include a completely new four-LED headlight, ride-by-wire throttle to enable multiple rider modes, a huge new ram-air system utilising a new headstock air intake, a new airbox, a revised fuel injection system for increased power and torque, and work to reduce internal friction. A ride-by-wire throttle system is an essential element of maintaining close control of engine mapping, fuel injection and combustion stability. The ride-by-wire throttle will work with a new exhaust featuring a more densely stacked catalyst to cut emissions and increase fuel efficiency. The airbox modifications are substantial, and have been done with both road and track performance improvements in mind. While the Blade has always been pitched as a road-orientated machine, the requirements of superbike racing and a bike that will work at the Isle of Man TT are clearly still very important. While MCN knows Honda are considering several options for the future of sportsbike development – including the Fireblade, an all-new 1000cc V4 called the RVF1000, and even a cheaper version of the RC213V-S, the only one that is definitely imminent as a new model is this new generation Fireblade. MCN’s sources have confirmed that the new Fireblade is scheduled to be revealed at the end of this year so it can go on sale as a 2017 model – 25 years after the original CBR900RR-N FireBlade, created by Tadao Baba took the biking world by storm. Sharper design ethosHonda insiders have explained the changes to the bike have created a ‘much sharper’ bike in regards to the engine performance, chassis and overall character. Honda’s air forceIf you want more power, the engine will need more air as well as petrol. This gaping-mouthed design will give the Blade a completely fresh look and will force air into the airbox. Keeping the path of high-speed air as straight a line as possible will help the engine work more efficiently. With this in mind Honda have designed the new intake to pass through the headstock, creating the straightest path possible into the airbox. LED lightsHonda have lodged patents dealing with the way the new quad-LED front lights will look and work, and the detail is very revealing. The four lights will share duties for dipped and main beam, and are shaped around the new central air intake. Öhlins electronic suspensionThe superbike market has changed massively over the past few years and to compete with the more exotic offerings, such as the Ducati 1299 Panigale and Aprilia RSV4 RF, the new Fireblade is expected to receive electronically-adjustable Öhlins suspension which can be programmed for both road or track use.